It’s party time at the Wiener Museum of Decorative Arts as we celebrate the art of having fun at our latest exhibition Carnival & Cabaret. With Carnival time approaching, we are exploring the flamboyant festivals in Venice, Rio and New Orleans as seen by porcelain artists from Europe. The masks of Mardi Gras and other carnivals take their inspiration from the Italian Commedia dell’Arte, itinerant troupes of masked actors who entertained in the streets of European cities from the 16th century onwards. Stock characters, such as Harlequin, Columbine and Pierrot, have become familiar in many types of popular entertainment around the world as comical clowns in Harlequinades, pantomimes and the circus Big Top. Masquerade balls became fashionable in high society during the 18th century heyday of the Venetian Carnival, which has experienced a huge revival in recent years. 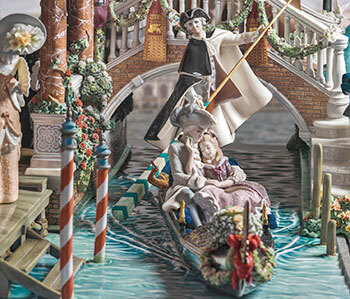 The monumental Carnival in Venice by Lladró, which is the centerpiece of the WMODA exhibition, teems with masked revelers during a magical evening in this beautiful city of canals and gondolas. Masking was also popular during the roaring 1920s to disguise the flirtatious behavior of the flappers and vamps. Party-goers dressed in the costumes of Harlequin, Columbine and Pierrot and were immortalized in porcelain by great European factories, such as Rosenthal and Royal Doulton. Magazine covers and greetings cards of the Art Deco era abounded in the imagery of the Italian comedy. The theme was also popular in variety shows and cabaret performances of the early 20th century as shown by Anita Berber, Lo Hesse, and Lena Amsel in the notorious nightlife of Weimar Berlin. The fantastic productions of the Folies Bergère in Paris and the Ziegfeld Follies in Broadway owe much of their inspiration to the theatrical excesses of Carnival time.